First FAMILIES and pensioners are appealing for improved sewage works in Marston after raw waste flooded the gardens of residents last year. Independent city councillor for Marston Mick Haines has been campaigning on behalf of residents who narrowly escaped their homes being flooded with raw sewage last year, after two pumps in Marston struggled to cope with high rainfall. After sewage seeped into gardens in the Old Marston Road four times in early 2014, Mr Haines was worried that the proposed 885-home Barton Park development could significantly effect the sewerage system in Marston as it is “downstream” from Barton. 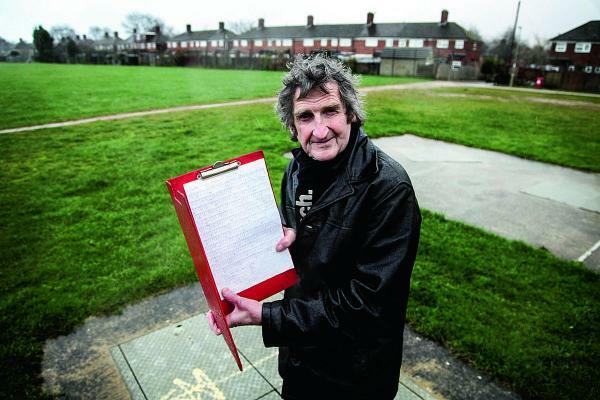 Development consortium Barton Park LLP has reassured Mr Haines that the large sewer main that is planned for the Barton Park development will not make the problem in Barton any worse. But Mr Haines wants Thames Water, the provider in charge of sewage in Oxford, to provide better facilities for the people of Marston and ensure that last years’ raw sewage overspill does not happen again. He added: “What we want is some bigger drains and for Thames Water to check up on the pump stations more often. Concerned Old Marston Road resident 85-year-old Fred Turner recalls suffering severe flooding last year. He said: “I’m getting old now and it’s hard to cope when you have this sort of flooding, it was very distressing.’’ Pastor of Marston Baptist Church Dr David Earl, also on Old Marston Road, also had his house flooded. The 48-year-old father-of-six said: “Our garden flooded two or three times earlier last year. It was very unpleasant.’’ Thames Water spokeswoman Becky Trotman explained a study of Oxford’s sewer system was being carried out. Old Marston Parish Council plan to remember former parish councillor and St Nicholas Church bellringer Roy Jones, who died in May 2014 aged 78. 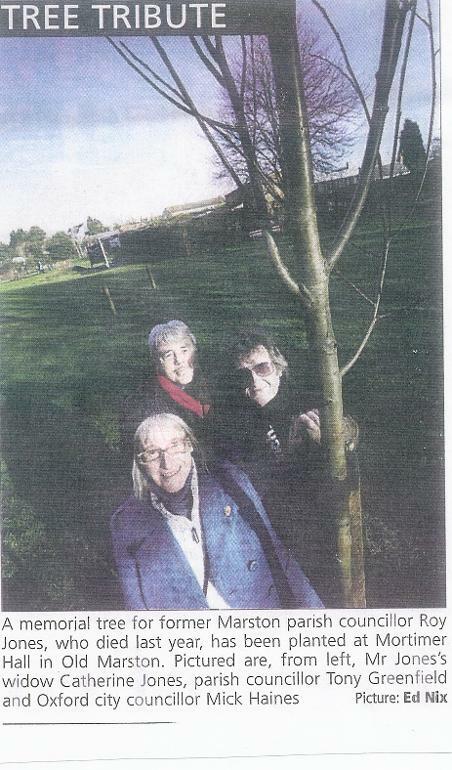 The parish council has agreed to plant a tree and place a plaque in the Mortimer Hall Recreation Ground in January. The project will cost £180, which will be funded by city councillor for Marston Mick Haines’ annual budget and a date will be announced in advance. As the long-standing chairman for the East Area Planning Committee, I would expect Labour Oxford City Councillor Roy Darke to listen to our Independent Marston Councillor Mick Haines for highlighting concerns that we all understand – and seek to solve – rather than criticise Mick (December 16, 2014). Labour’s city council has sold their own land not to build council housing [which Roy salutes in his letter] but to high profiteering private development or excessive unnecessary student accommodation, which equals overdevelopment in Marston. It’s too late for Roy to liaise with Thames Water now. This should have been in place when considering each build and its effect on our neighbourhood. Conditions can be put in place to install underground pipework before building starts. This ensures developers are made accountable, services are connected and functioning effectively. When building the JR extension we paid for unwanted soil from the development to spread at Court Place Farm. This blocks the natural gravel drainage and insufficient underground pipework from the JR has meant flash flooding occurs in Northway. Why should locals praise ‘Barton Park’? It is a private development who you gave permission to provide less affordable housing than they should. The development will severely increase traffic and sewerage problems our way. Thames Water have already admitted that the sewerage storage tanks installed at Croft Road Park and Court Place Farm are not adequate. There are no plans to improve these inferior provisions, but claim Barton Park’s installation will be better. SUPERMARKET giant Tesco has confirmed it will not be building a new store in Marston, to the great delight of campaigners. 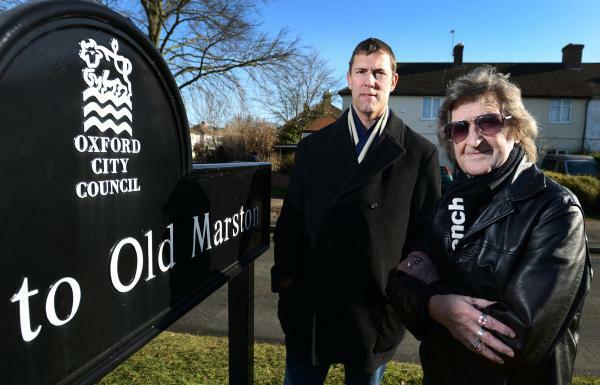 Residents have campaigned against the chain and its plans to open a convenience store in Old Marston Road since 2009. Two plans for a Tesco Express to be opened on the site of The Friars Pub were rejected by Oxford City Council, the chain successfully appealed the decision in 2011Now the chain has confirmed to business owners that they will not be opening a store due to a lack of resources. Labour MP for Oxford East Andrew Smith inquired about the state of the site, which has remained derelict since 2011, and received confirmation on Friday of Tesco’s decision not to go ahead with the store. City councillor for Marston Mick Haines said: “I’m over the moon. “It’s been a long battle and I’m especially happy for the Post Office and Costcutters, that could’ve been damaged by the Tesco’s opening. Member of Marston Residents Group 58-year-old Alan Foulkes added: “I’m absolutely delighted that Tesco have pulled out of Marston for money reasons. Mr Foulkes said: “I think what is important is that the local people of Marston are asked what they want on the site. Mr Haines said that he would like to see social housing on the site, or a Wetherspoons to replace a number of pubs that have closed in Marston in recent years. Last September, Tesco warned that its profits were overstated by £250m and three directors are suspended as a result of the accounting “black-hole”. In January, the supermarket announced its plan to close 43 stores and put 2,000 jobs at risk. This included the Tesco Metro in Bicester where 56 people will be made redundant. Then earlier this month, chief executive Dave Lewis announces plans to slash 10,000 jobs across 3,300 stores nationwide. AN INDEPENDENT councillor is concerned that a new 885-home development will lead to overflowing sewage drains across Barton and Marston. Oxford City Council’s Mick Haines fears recent incidents of raw sewage seeping into residents’ gardens could be worsened by the new Barton Park development. Construction is set to begin early next year, but Mr Haines is worried the current sewage system will not be able to cope with the additional housing. He said: “With 2,600 additional residents on the Barton Park development, the current sewage stations won’t be able to accommodate that many houses. In April 2014 the Oxford Mail reported raw sewage overflowing from manholes after flash flooding on Old Marston Road. 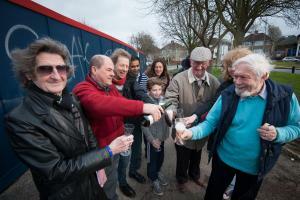 Mr Haines said: “Houses in the area have been affected by raw sewage overflowing for far too long, and the problem will only get worse once the new development is built. Mr Haines also claimed the homes would add to heavy trafficin Old Marsh Lane, which runs through Marston. He said he had counted 1,032 cars and vans, 41 motorbikes, 11 cyclists and 15 large lorries from 7.30am to 9am on Monday. “The traffic will only get worse as this is the main road to get into central Oxford for Barton Park. “I certainly don’t oppose the Barton Park development as there is a desperate need for more housing in Oxford. Mr Haines said the developer and council told him overflowing sewage earlier this year was due to flash flooding that was likely to happen once every 100 years. A spokesman from development consortium Barton Oxford LLP said: “Following consultations with Thames Water it has been agreed that the Barton Park development will provide an oversized sewer main that runs under the spine road. “This large sewer will provide sufficient storage to hold effluent from the development in a storm event and release it slowly into the network, thereby not making the downstream flooding any worse. “A detailed traffic survey and traffic impact assessment was undertaken prior to the grant of outline planning consent. “This informed the traffic management proposals for the development, which sought to minimise the impact of the development on the wider network.